The exterior of the Collis Center at Dartmouth. This is the band’s second show at Dartmouth, having made their debut at a co-ed house on Fraternity Row on 1/28/89, on their way home from the triumphant Paradise gig. It’s interesting that Dartmouth only pops up at this point. I would think that such a major school so close to the Vermont border would have been easier to book, especially maybe with some crossover with Amherst. Maybe the word of mouth just hadn’t travelled that yet. 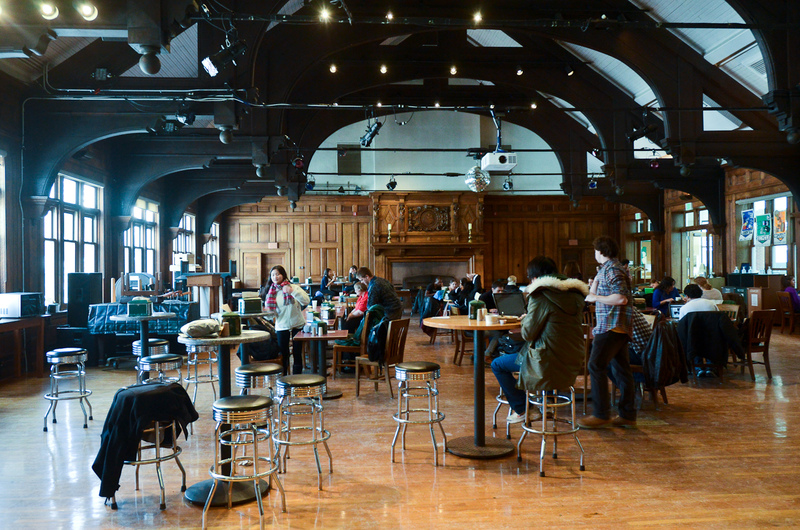 Dartmouth would remain a stop on Phish tours until 1991. 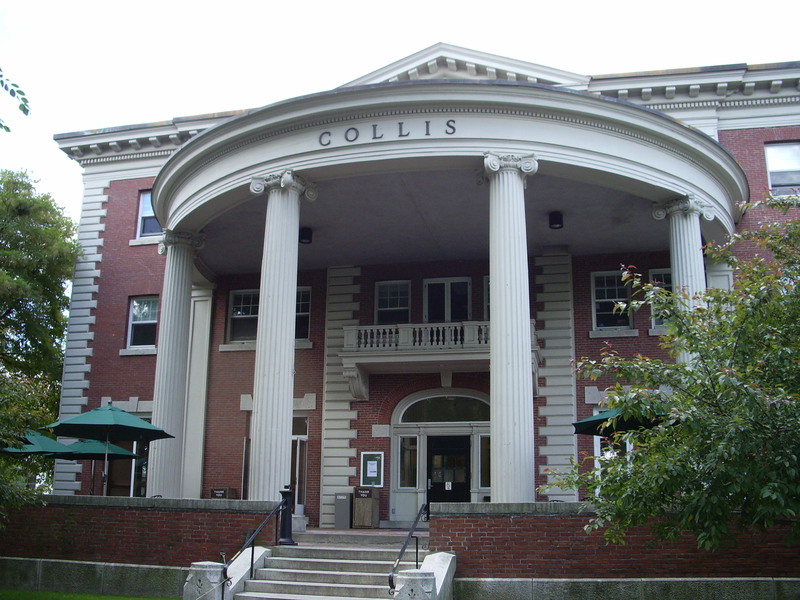 Phish played this show at the Collis Center, the student center on the corner of Massachusetts Row and Route 10A, the main drag through town. The building dates from 1901 but don’t go looking for it exactly how Phish played there, it has since been renovated in 1993. There’s no longer even a cafeteria in the building. The photo posted is believed to be the space they performed in, which with its woodwork, would have made an epic setting for Phish. The space that would make sense to be the old cafeteria at the Collis Center. The show is pretty solid and much easier to listen to than the previous night at Hamilton. It kicks off with a solid “You Enjoy Myself”, nothing outstanding but worth hearing for the copy uploaded was at some point erroneously dubbed over with Blind Faith. It’s always fun to hear audibles and clearly Trey throws one be going into “I Didn’t Know”, as Page seemed ready to play Esther. “IDK” with a complete vacuum solo follows and Fish is really starting to find his stride on the unique instrument. A swinging “Mike’s Groove” follows. “Mike’s” builds to a blistering peak with great organ work from Page and a hot lead from Trey with him starting to show off his signature sustain. Be sure to put emphasis on the “Groove” because it’s really starting to cook like it should. Trey does a narration taking the crowd from Weekapaug, RI to Gamehendge. This leads to a trio of Gamehendge songs, “Esther”, “The Sloth”, and “Possum”. “Esther” is strong with a great outro from Trey. “Bold as Love” splits the Gamehendge sets with a solid version that drops a lot of Trey’s attempted effects. Trey gets a request for “The Tire Song”, which Trey pushes aside. “WE’RE NOT GONNA DO THE TIRE SONG!,” he exclaims. Fish teases “Time Loves a Hero” while Trey banters. “Bag” is pretty short and to the point. “Forbin’s>Mockingbird” is fantastic and includes a brief narration, which was unusual at this point. Set 1 ends with a rocking “David Bowie” that unfortunately cuts off before the peak. This feels like an unusually long first set, potentially due to its pacing as it is actually only 94 minutes. Set 2 kicks off strongly with the best “Donna Lee” so far. Those nights as the Johnny B. Fishman Jazz Ensemble were really paying off as the whole band is really showing the 4-headed monster mode they would perfect, nailing the tight head section of this bebop classic. It is a must-listen. “Suzy” is nothing but “Suzy”. Phish finally plays “The Tire Song” aka “Contact”. More mid-set Hendrix with “Fire” almost acting like a mid-set energy boost. Phish nails a glorious “Harry Hood” with a nice slow build. After “Hood”, Trey mentions that Phish will be playing an all-ages show at the Paradise on June 9th, a show that is not on Phish.com or Phish.net. He also says that Phish has a guestbook/mailing list in the back. A solid “Golgi” goes into “Slave”. The “Slave” here is interesting because the outro is effectively Mike-centric with him throwing little bass fills over Page while Trey just lays down some sustain and feedback and to end the song they just let everything dissipate to send the set. There’s a cut in the tape but it’s clear “Divided Sky” is the encore. Page says how Phish has to take off, not really giving a reason but they come back for more music after a pause. They also find Kristen Tierney’s wallet and get it back to her, which is nice. The recording cuts off midway through the peak of the song but we do get some fine displays of Trey learning to use that sustain again. All in all, a solid showing for the Ivy Leaguers on this one. I’d give it a spin.